Last weekend saw the Scottish Junior tour get off to a flying start at the Central Junior Open and Harrow sponsored juniors Orla Young and Fraser McCann were there to pick up the top prizes in their divisions. Orla won Division 4 and Fraser completed the Newlands double by winning Division 2. Peter O’Hara, the delighted coach, reported that Fraser didn’t drop and game and Orla beat all the boys in their respective divisions. He was very impressed with their performances and so the training is obviously going well! Orla Young from Newlands won the 2015 West Junior of the Year in June for her achievements in the 2014/15 season. Orla, pictured with her winning salver, along with her trophy for winning the West Closed U13s (and her Harrow Stealth Camo racket) played for Newlands’ Ladies and mens/open teams and won over 30 matches!! What a great achievement Orla – well played and Harrow is proud to sponsor you. Dougie Kempsell wins the P.S.A. $5K Shepparton International Tournament in Melbourne this weekend with a stunning run of form and determination to clinch the top prize. He was seeded No.5 and so had to beat the No.4 and No.2 seeds on the way to the final. 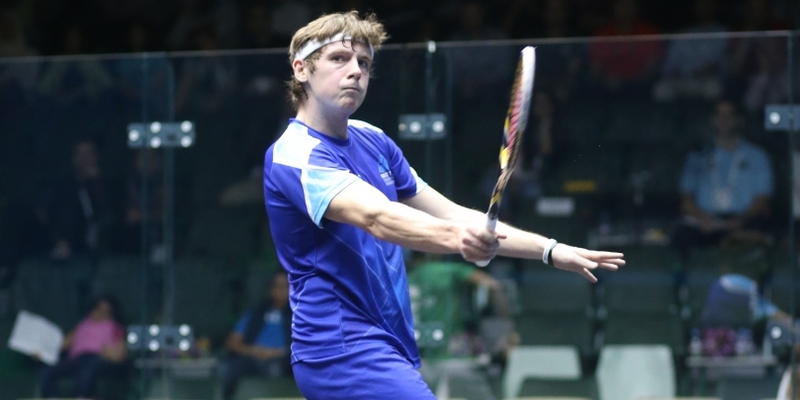 The first of these matches was an hour and a half marathon against Tayyab Aslam the No.2 seed from Pakistan (and World No.84) which Dougie won 11-5 in the 5th. And if that was a marathon then the very next day was a triathlon as Dougie beat the home player and No.4 seed Josua Larkin in a match lasting 2 and a half hours! And it went all the way to 13-11 in the last game – what an effort! So to The Final and it’s amazing that Dougie had anything left after those last two matches, but he did and won the final 3-0 against Josh Masters from England in just 34 minutes. Fantastic win Doug and many congratulations.